The town of Stratford-upon-Avon is not one of England’s bigger towns but it is one of the country’s most popular and visited settlements. The town is known throughout the world for being the birthplace of William Shakespeare. In modern times it has become a site of pilgrimage and is one of the country’s most popular touristy spots. Stratford-upon-Avon is a town with streets full of half-timbered houses and a mood of prosperity that would still attract visitors from the four corners of the world even if it wasn’t Shakespeare’s place of birth. The most famous landmarks here are the five houses which are connected to the famous writer. They are known as the Shakespearean Houses. One of them is the house where William Shakespeare was born in 1564. Another is the childhood home of Anna Hathaway, Shakespeare’s wife. Aside of the Shakespearean House, the town is also the location of the 13th century Trinity Church. It is in the graveyard of this church that William Shakespeare and is family were buried. However the main attraction of the town isn’t the Shakespearean House or the Trinity Church but the Royal Shakespeare Company. It is one of the finest and most acclaimed repertory troupes in the world. The troupe stages plays for the visitors of the town on a frequent basis. A total of three theatres are located in Stratford-upon-Avon. The Royal Shakespeare Theatre is known for staging classic plays, including matinees, so that the visitors that are leaving town early can attend them. The Swan Theatre is in an Elizabethan-style and was reconstructed according to the specs of the famous Shakespearean Globe Theatre. The last theatre of the town is the Other Place which is a more private and intimate venue that stages experimental productions. The Stratford-upon-Avonis also home to the renowned Windmill public house which dates back to Shakespearean times and is believed to have been frequented by the writer. The Black Swan more commonly known as the “Dirty Duck” is another well-known local pub. The latter is the favorite spot of the local actors. So between sightseeing and attending plays make sure that you spot by these two remarkable public houses to get a better understanding of the local way of life. Stratford-upon-Avon is home to a myriad of hotels where travelers can rest and relax after their days of wandering through the town. The most famed hotels of the town are the Swan’s Nest Hotel and Ettington Park Hotel. You can easily say that Stratford-upon-Avon is a must visit place in England, especially if you are a theatre aficionado. 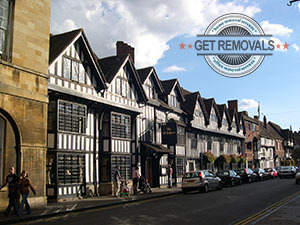 So as soon as your removal is over – take a well deserved vacation and visit the hometown of William Shakespeare. However before you pack your bags and leave make sure that you arrange all the details with the company that has provided you removal services. Also don’t rush into returning from your vacation. Instead take your time to fully explore the visit and recharge your batteries properly.